The Danes have a word, hygee, (pronounced hue-guh) that has no direct translation as it is a feeling of coziness, comfort, happiness, and security — all rolled into one. Think sitting by candlelight with a cup of tea or staying in to have a glass of wine with friends on the couch. To be hygeeligt, is more than experiencing a nice feeling, it is a consciousness of being present and enjoying the moment. The Danes created hygee as a way to break up their long dark winters and speaking from personal experience living in Denmark, creating hygee in daily life was the key to surviving the drudgery of the darkness. I would call our week of Post-Labor Day sailing, a hygee cruise. Early September can bring some of the best conditions New England has to offer with summer weather without the masses of tourists. However, it can also bring an early Fall. Our week fell on the later, with winds averaging over 20 knots the entire week and over 24 hours of rain and clouds. However, we didn’t let the weather stop our time away from the hustle and bustle of mainland life. We limited our distances sailed and enjoyed our time at anchor relaxing, eating, and drinking in the comfort of our home away from home. Days were noticeably shorter, yet indulging o a nice glass of red wine while reading in the evenings or a snuggled under a fleece blanket sipping on dark roast coffee in the morning cured any fore longed thoughts of summer. Also having our little terrier, Scruffy curled at our feet helped. We call Scruff a professional snuggler because he will wiggle his way into the most comfortable spot at all times. The trip was not without adventures though. We left Monday, Labor Day, at the crack of dawn from Jamestown to catch favorable tides and winds to Martha’s Vineyard. We surged 38 miles downwind with the kite up in 20+ knots before eventually taking it down to stay in more control with the big wave state. 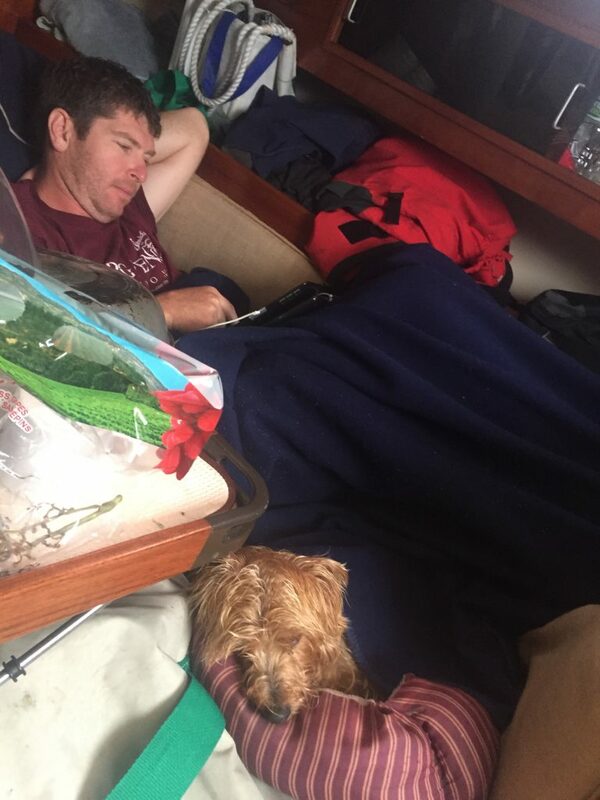 By midday, we were happily on the hook in Vineyard Haven with plans to wake early again the next day to head for Nantucket, 30 miles away. 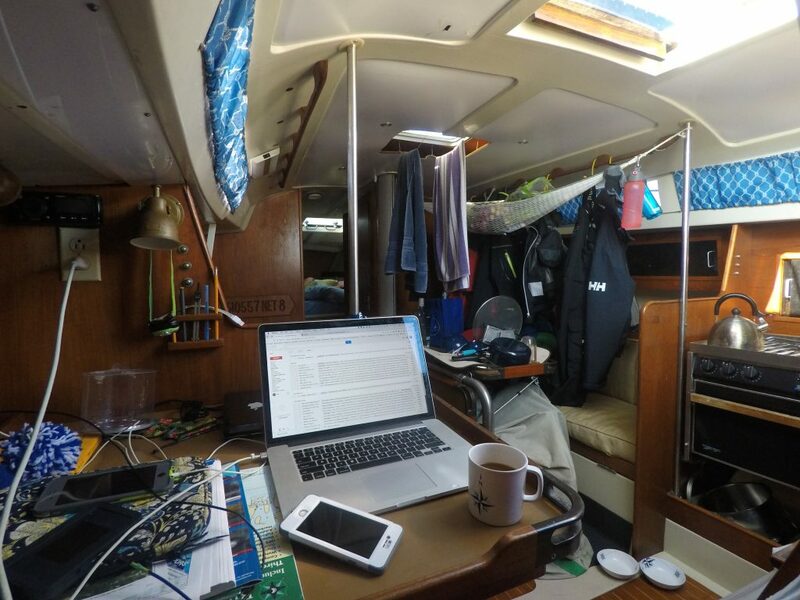 However, it became quickly clear as the forecasts progressed, Nantucket would be out of the question as the wind was going to top out at 35 knots between us and the island. So we decided to settle in Vineyard Haven close to the break wall and snuggle in to watch the sunset with some Gin and Tonics and bruschetta. For dinner, I made the FAMOUS Wilson Pasta. 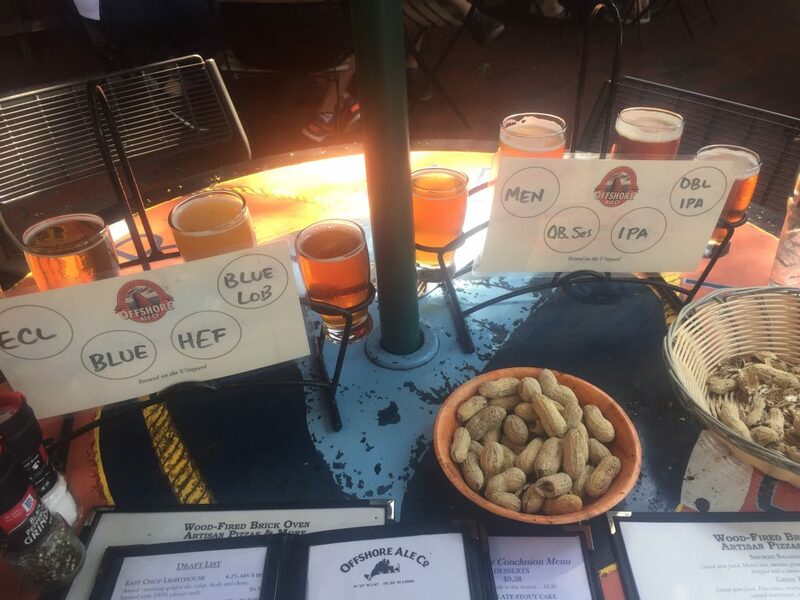 Tuesday we got out the folding bikes, put Scruffy in his basket, and headed to Oak Bluffs, one town over to the Offshore Brewing Co. We sat on their patio with Scruffy and each got a flight of beers which allowed us sample all the offerings and flatbread pizza. I highly recommend this place because they also give you peanuts while you wait! 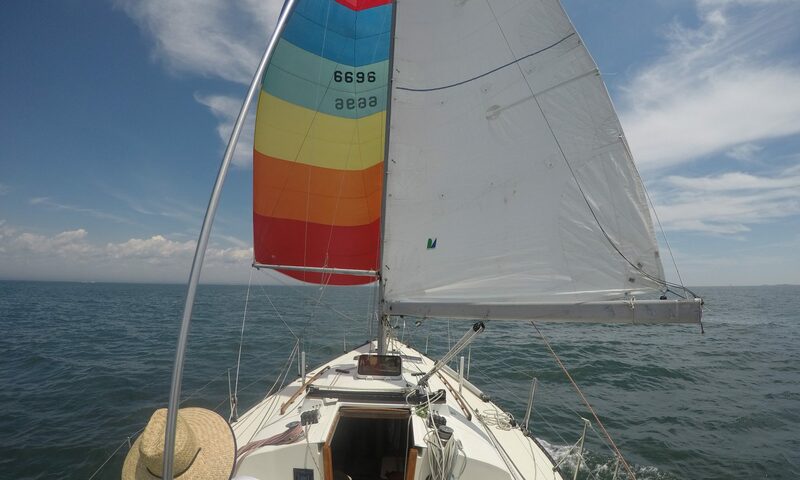 As the weather was looking dismal for Wednesday, we decided to pull up anchor at 5pm on Tuesday and head 7 miles across the Vineyard Sound to Hadley Harbor, a hurricane hole we read about located in Wood’s Hole. The trip across was a quick one as we saw 30 knots at one point but averaging around 22kts. 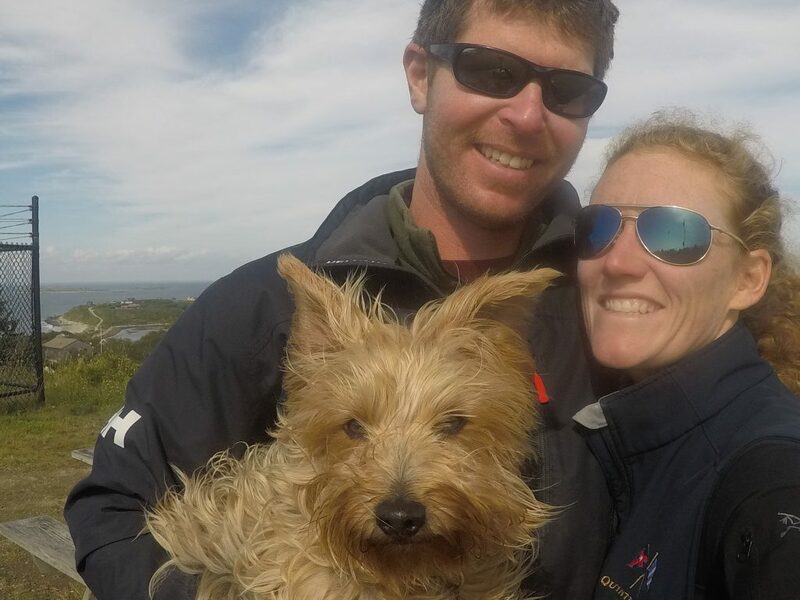 Scruffy wasn’t a fan of the healing so I held on to him and Brandon navigated us through the chop and between ferries into Wood’s Hole. The current that rips through here is like trying to sail up a river if you don’t go at the right time. We didn’t go at the right time. However, it is short lived and we motor through and sailed into Hadley Harbor. You would miss this Harbor if you didn’t know it was there. From a distance, it looks just like land, but it’s actually 4 private islands that come together making a few coves that are protected on all sides. The Forbes family has owned these islands for over a hundred years. Wikipedia tells us that they are now all in a trust held by the family and there are 3 dozen homes spread throughout. Bull Island is the smallest of the islands and the trust allows the Public to go on it. They keep a path cleared in the middle of the island and maintain a dock with a gangway. We anchored right next to Bull and the island became our way of walking Scruffy in the mornings and evenings. Tuesday evening I grilled Tuna Steaks marinated in Pineapple Terriaki with a Guacamole inspired Avacado spread on top. In the morning, we were happy to find the rain held off until about 11 am on Wednesday but then it poured for hours on and off. We got in a walk and some swimming then spent the whole day down below reading, working, eating, and drinking. It was wonderfully boring. Unfortunately, we also were watching the devastation in the BVIs, where we have been frequent visitors. It was hard to watch the radar, photos, and videos roll into our social media as our heart broke for all of the people and places we hold dear down there. 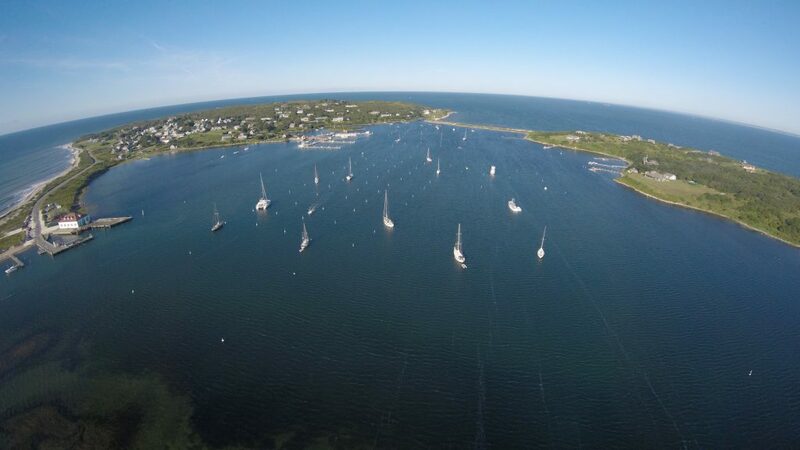 Thursday, we woke early and headed upwind in 15-20kts via Buzzard’s Bay against the current to Cuttyhunk, the most western of the Elizabethian islands and another one of our favorite spots. 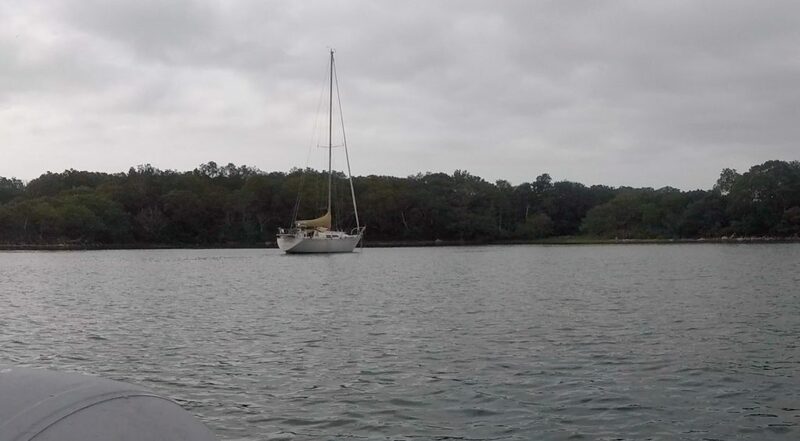 We arrived midday, and despite there being 50+ open moorings, we anchored because they still wanted $45 in the offseason. Brandon invested so much time and energy into our new Windlass, its just not worth it for us. 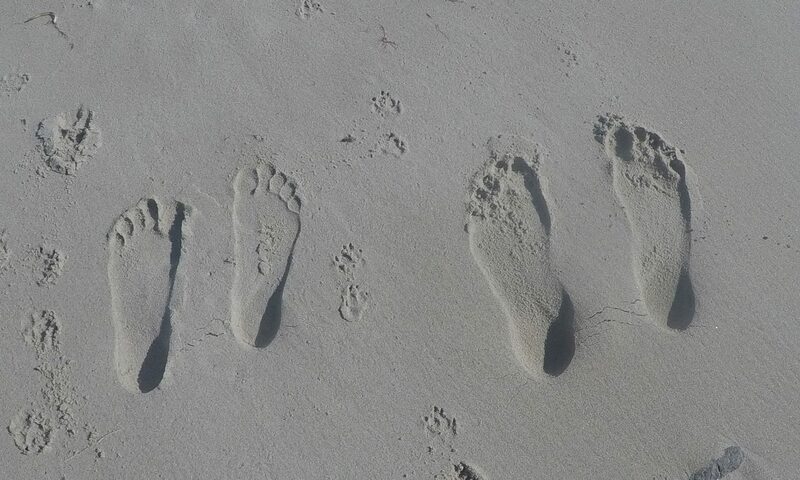 When the sun finally came out, we headed ashore to explore the island. Despite having been here many times, it is always a fun place to take in the views from the top of the hill or feel the soft sand on Church Beach. We probably saw 3 people total on our trip ashore which included the Market lady. She was only open from 3:30-4:30 and we need a vital ingredient that I had run out: limes! We headed back to the boat and grilled up some veggies and steak tips for our final dinner onboard and watched a beautiful sunset. Cuttyhunk is one of the few places on the East Coast you can watch the sun go down over the ocean. Friday, we woke up and started to head home early because the winds were only going to get greater as the day went on. Unfortunately, it was once again upwind and against the current but it was pleasant conditions. I was able to do some work via my laptop while the auto pilot and Brandon did most the work. By 3 pm we were back at Jamestown Boat Yard. It wasn’t the wildest adventure we have had on her but it was the coziest and yet still one of the most enjoyable cruises. A hygee cruise for the books!